From 1851 until 1854 there were several different buildings owned by several different people on the lot now occupied by the Brady Building. The majority of these were bordellos and bars. In 1854 all the structures on the lot burned to the ground. They were replaced by more wooden buildings that also burned, in 1857. After the fire the lot was sold to William Daegener who leased it to a man who built a one story frame building called "The City Hotel". For a time the site was used for a barber shop, post office, stationairy store, restaurant or book store. The building collapsed during a wind storm in 1876. Matthew Brady bought the lot in 1899 and constructed the building that is located there today. The State purchased the structure in 1947 and the Howard Van Kessel family ran the concession for many years. In 1987 Candy Camin took over the contract until 1997. 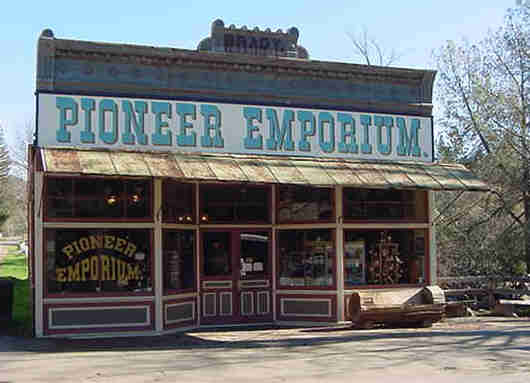 The Pioneer Emporium is now run by David & Maryann Brown.